All over the developing world, people want more or better education than governments provide. Where cities are growing at unmanageable speed, the private sector is taking up the slack. In India the private sector now educates nearly half of all children, in Pakistan more than a third, and in both countries the state sector is shrinking. Even where the state does pretty well, as in East Asia, richer people still want better schooling for their children than the masses get. 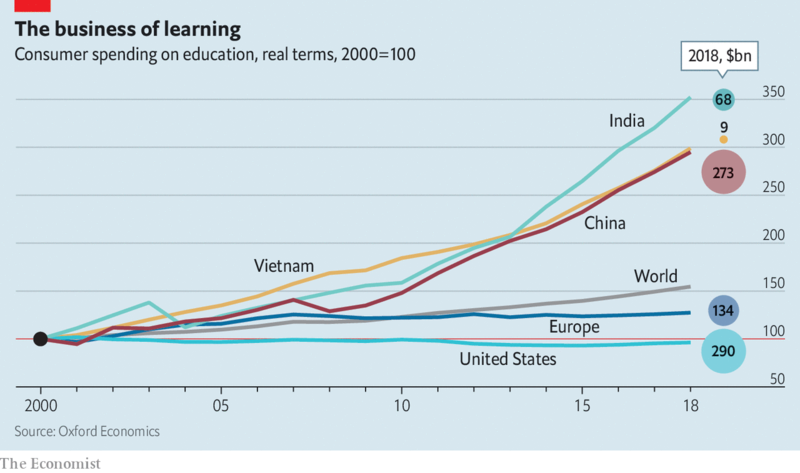 Thus Vietnam, which has an outstanding state-school system for a poor country, measured by its performance in the OECD’s PISA test, also has the fastest-growing private sector. In most ways, this is an excellent thing, because the world is getting more, and better, schooling. In rich countries, once the background and ability of the children who attend private schools are taken into account, their exam results are about the same as those in the state sector. But in developing countries private schools are better—and much more efficient. A study of eight Indian states found that, in terms of learning outcomes per rupee, private schools were between 1.5 times more cost-effective than state schools (in Bihar) and 29 times (in Uttar Pradesh). But private schools also increase inequality. They tend to sort children by income, herding richer ones towards better schools that will enhance their already superior life chances and poorer ones towards shoddy establishments that will further undermine their prospects. That is one reason why many governments are troubled by their rise. Other reasons are less creditable: teachers’ unions, which often have a hold over governments, tend to oppose them, and their growth reduces politicians’ power. So for good and bad reasons, governments are squeezing private schools, banning profits, cutting or capping fees, and using regulations to close them or make their life difficult. Governments are right to worry about private education’s contribution to inequality, but they are wrong to discourage its growth. The freedom to spend your money on improving your child’s potential is a fundamental one. Whether governments formally allow it or not, people will find ways of buying private education, by tutoring children out of school or bidding up the price of property near good state schools. Governments should instead focus on improving the public sector by mimicking the private sector’s virtues. Freedom from union power and independent management are at the root of its superior performance and greater efficiency. Governments should therefore do their best to weaken unions and give school principals more autonomy to innovate and to fire underperforming teachers. To spread the benefits of private schools more widely, governments should work with them, paying for education through vouchers which children can spend in private schools, or paying privately managed schools to educate publicly funded children. These schemes do not always succeed, but Chile, Pakistan and the Netherlands have all demonstrated that big, properly designed and managed voucher systems can work well. Children in Chile, whose entire system is voucher-based, do better than in any other Latin American country for which the OECD collects data. But vouchers should be limited to non-selective schools that do not charge top-up fees; otherwise governments will find themselves subsidising the better off and increasing inequality. The world faces plenty of problems. Governments should stop behaving as though one of them was private education. It will, rather, increase the chances of finding solutions.